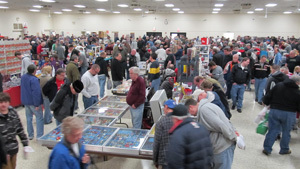 Click here to see a short video of the Countryside Collectors Classic Toy Show. Do you have a collection of old toys you would like to sell? Are you a vendor looking to participate in a show that offers you hundreds of interested buyers? Look no further, give us a call today and participate in one of our well advertised & heavily attended shows! As this photo shows, you'll find all sorts of vehicle and toy model buyers. Cars, trucks, trolley cars, fire trucks, double decker buses, airplanes and trains. There is also a lot of collectible toy buyers as well.